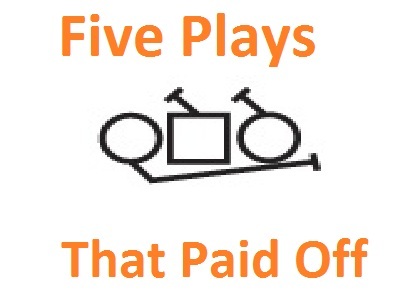 After a far-longer-than-expected hiatus, the Five Plays that Paid Off are back! 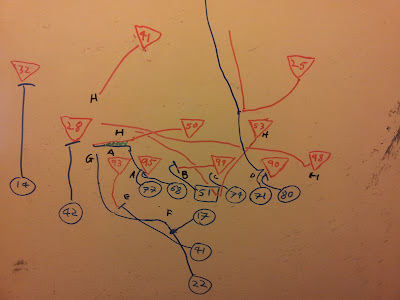 For the rest of the season, as a preemptive move, I will say that while the aim is still to get five plays out each week, it's not always going to be feasible - but fear not, during the offseason, there will be a "Missing Plays" series, making sure that there will have been five plays from every week broken down. So, please feel free to continue sending in nominations for plays to be broken down - either on Twitter using the hashtag #TPL5plays , or in our Facebook group - and they will be gotten to eventually, either during the week or during the offseason. Anyway, on to the break down. The last play we broke down was a Reggie Bush run (back in Week 4.... mea culpa), so it's only fitting that we end the hiatus with another Reggie Bush play. The play, a straight forward outside-zone run, shows how, even when the play is (largely) blocked correctly (we're looking at you, John Jerry and Jonathan Martin! ), the blockers can only do so much - and how a running back with the athletic abilities of Reggie Bush uses that agility to turn a potentially small-ish gain into a touchdown. Enjoy! 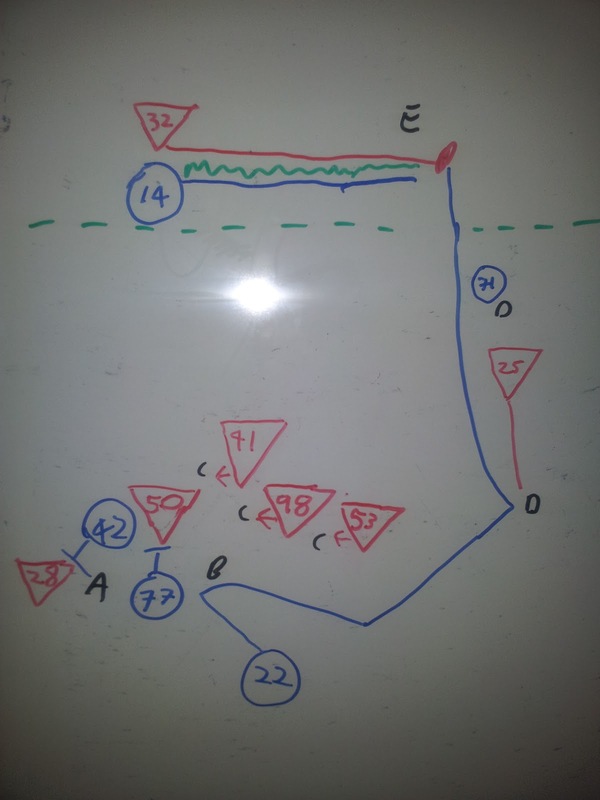 After the huddle: The Dolphins line up in a basic I-right formation, with tight end Charles Clay lining up as the flanker on the right. 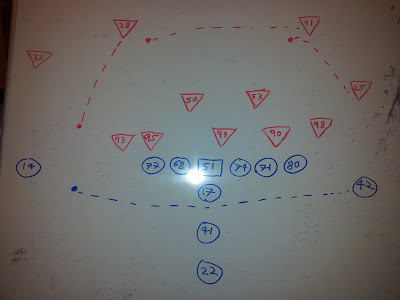 The Colts line up in a two-high shell, with both corners playing off their man (Vaughn in particular playing deep off). The play: This play has gotten widespread attention & love because of Bush forcing several defenders to miss tackles on the way, but the play itself wasn't particularly spectacular, rather it was just a straight-forward outside zone play to the weakside. I won't go through the rules of outside zone here - having done so on a previous occasion - so instead will move on immediately to breaking down the play. As always, the key elements of this play are marked with letters, in this case A - H in Fig 2. At Point A, we first see Jake Long briefly get his hands on Fili Moala before moving up into the second loevel, while Richie Incognito moves across and takes over the block on Moala, locking him up until after the play is past them. Long moves up to Jerrell Freeman, who has gotten outside of him; in keeping with outside zone rules, Long blocks Freeman towards the sideline, marked by the green squiggle between them. Moving inside the line, Mike Pouncey moves laterally to the left, with Antonio Johnson moving with him. Pouncey appears at one point to try and get past him to the second level, but shortly afterwards he just puts his hands on Johnson and blocks him (B). Right guard John Jerry clearly is taking the deep angle to Johnson, looking to take over the blog from Pouncey (again in keeping with outside zone rules) but as the center never moves up to the second level, he stops trying to get outside of Johnson and turns upfield, just in time to see Connor run into the backfield behind him (C). He tries to get a hand to the linebacker as he gets past him but is unable to do much except cause him to briefly stumble as he runs around Jerry - but we'll pick up with Connor when we get to point H.
Point D shows Martin briefly get his hands on Cory Redding in much the same way as Long did on Moala, and likewise moves up, this time all the way to Powers who's rotated up to safety, while TE Anthony Fasano takes over the block on Redding, locking him up for the rest of the play. Martin initially gets his hands on Powers, but the DB disengages and drops deep and towards the middle of the field. Martin runs to catch up to him, but Powers pulls up while Martin, not expecting it, continues to run forward and overshoots Powers, who is then left free. Moving to the backfield, fullback Lane immediately runs to Freeney, locking him up and sealing him to the outside. Tannehill hands the ball off to Bush, who heads towards the B-gap, but then flows to the outside (F), around the back up of Lane's block on Freeney, where there are three defenders coming down 'over' him, marked by H. The first is Bethea, moving down from his safety spot; the second is Robert Mathis, who, being left unblocked, read the play and runs laterally, shadowing Bush so that he's in position directly in front of him when the running back cuts upfield. Finally, the third defender is Connor, who, having gotten around Jerry (back at pint C), chases the play down from behind and, presumably with an awareness to be careful not to approach at too shallow an angle in case he got burnt, runs diagonally in order to get 'over' Bush, who is running laterally towards the sideline. Bush continues running towards the sideline, apparently looking for a crease on the outside, but soon finds his path to the outside blocked by Long and Lane blocking their respective defenders (point A in Fig 3). 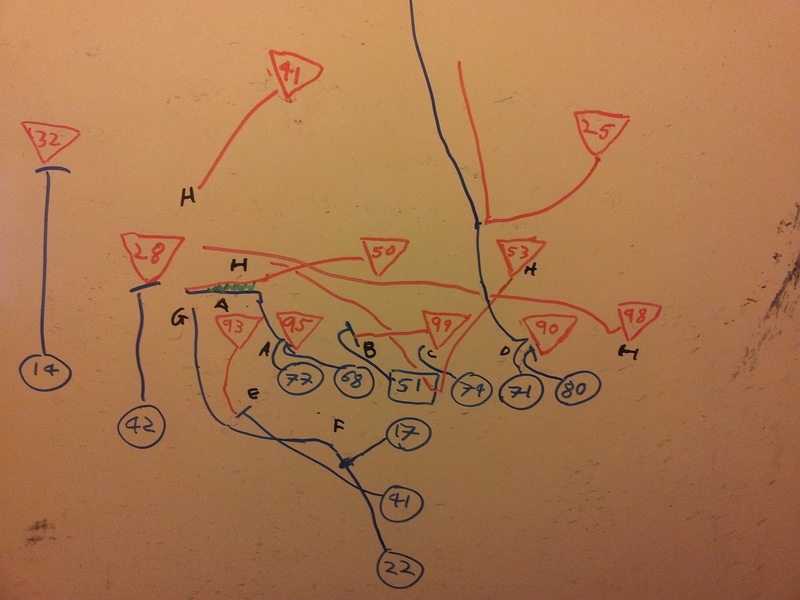 Instead, Bush cuts upfield just inside of Long, but has the three defenders mentioned above closing in on him. The next phase of the play comes down purely to Bush's athletic talents, and that alone made the difference between a three-yard gain and an eighteen-yard touchdown. With Bush about to run into Mathis, the running back simply plants his foot (point B), stopping sharply, then bursting immediately in the opposite direction while Bethea, Mathis and Connor, unable to control their momentum with nearly the same ability, overshoot hiim towards the sideline (point C). Bush runs across the middle of the field, turning towards the end zone. As covered in point 'D' in Fig 2, Jonathan Martin had been chasing Powers, but, similarly to how Bush out-juked the three defenders, Powers stopped short, allowing Martin to over shoot him and freeing himself up to tackle Bush. Powers, seeing Bush coming towards him, runs down to tackle him, but makes sure to stay outside of him to ensure that Bush doesn't get free reign along the right sideline (point D in Fig 3). Bush, however, cuts inside of him, leaving Powers to lamely reach behind him, getting a hand to Bush's foot, but doing nothing more than causing him to stumble a single step before recovering himself as he crosses into the end zone. As he scores the touchdown, Cassius Vaughn, being blocked by Marlon Moore, works his way across the end zone, and with Moore disengaging as Bush crosses the goal line, Vaughn runs up and callously (and needlessly) barges his shoulder into Bush (point E), leading to an unnecessary roughness penalty that will be assessed on the ensuing kickoff.